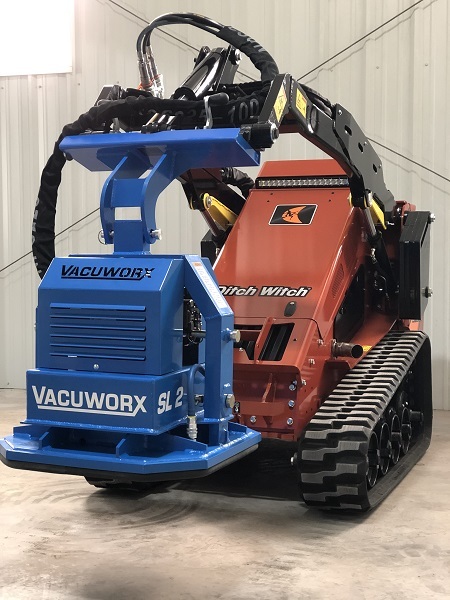 Vacuworx recently introduced the next generation of its SL 2 Subcompact Vacuum Lifting System. Originally launched in 2016, the SL 2 was the first compact equipment attachment in the company’s growing lineup of products for the concrete construction industry. The vacuum lifter has revolutionized the way saw cut concrete can be handled on jobsites, saving man hours, promoting safety and reducing debris. Now, the lightweight system has been updated with an improved hydraulic system and modular pads to work with more machines and for more applications. Concrete construction and demolition contractors have been quick to recognize the advantages of using the SL 2 to overcome common jobsite restrictions such as loud noise, debris and vibration. While the original integrated pad was designed to work for most common applications, contractors continue to identify more opportunities to put the system to work and have requested additional pad sizes for even greater versatility. The SL 2 now features a base unit — available with manual or wireless remote control—with modular pad options. The standard 24” x 24” pad is still available, along with a 12” x 36” pad for handling more narrow trench cuts, as well as other sizes upon request. All system components are fabricated from high quality aluminum to maximize overall lifting capacity with the host machine. The base unit and pad together weight is approximately 100 lbs. In addition, the updated SL 2 features a redesigned hydraulic system. Vacuworx recommends operating the attachment on host equipment with a case drain. However, the company recognizes that some machines, such as mini excavators and older skid steer models, may not come equipped with a case drain so Vacuworx engineered an innovative hydraulic design to allow contractors to be able to use the SL 2 with the equipment they already have. What hasn’t changed is the innovative patent pending design that delivers a lifting capacity up to 2,700 lbs and features quick-connect hydraulic hoses and a factory pre-set flow control valve to ensure optimal performance. There are two mounting assembly options depending on the host machine: mini/walk-behind subcompact equipment or standard skid steer-type machines. The SL 2 is also compatible with small excavators, backhoes and cranes using the clevis hook connection. The SL 2 operates using the auxiliary hydraulics from the host machine (minimum 10 gpm required with maximum 3,000 psi). The vacuum pump maintains a constant vacuum in the pressure reservoir. When activated, the system pulls a vacuum between the vacuum pad and the object to be lifted, providing a powerful positive seal. Vacuworx Tough Seal pad seal is used on the vacuum pad to cover the material to be lifted and create the necessary suction. The vacuum seal holds until the operator activates the release (even in the event of a power failure).